I am so excited that today is October 1st! I had such great plans for our party, but then due to a nightmarish night last night, I woke up with a severe migraine that nothing could take away. Beth decided to wake up at 5:30 this morning. Which is fine, because I was already up. We cuddled on the bed for a while, and then she thought she had to go potty. Her excitement over not going potty woke up Faye, who promptly woke up Keith. I decided to honor the day by making Keith an incredible lunch. I was all kinds of proud. He was less than impressed. Silly boy. He doesn't know how good he has it. When I was a kid, I got a smooshed peanut butter sandwich, a whole tomato or green pepper, and if I was really lucky, I would get a quarter for milk. After taking the kids to school, Beth was tugging on her ear, (her very clear sign that she was ready for a nap) so I put her in her room, and I laid down in my bed. Except sometime between yesterday and today she learned how to open her door. She kept coming out of her room, giggling, and saying "Night night, Mommy!" I finally got up and locked her door. Because remember when this happened? That is why I can lock her door now. I was able to sleep for two blissful hours before she woke me up. I have no idea if she slept or not, but I did. Although it didn't touch the migraine. And then I was saved by an angel today. Lisa stopped by because she felt like I could use a treat. She knew about my nightmareish evening and was just being a sweetheart. As soon as I opened the door, though, she could see that I was in a lot of pain, and she took my girls to play with her kids at her house. I was so overcome with gratitude for all the help Lisa has been, that with the quiet thud of the front door, I dissolved into tears. Of course, I had to quickly stop, because when dealing with a migraine, tears always make it worse. And then I went to my room, and lay down and slept off and on. Lisa brought them back around 4:30, along with dinner for us. Seriously, she has been an absolute angel these past two days! Once the kids were all home, they decided to play outside for a bit. They found a bottle of spray paint which I thought was empty. Apparently it wasn't. They found the old car that we are trying to get ready to sell. They thought it would be fun to put the two of them together. And then Faye came in the house and said "Mom, don't kill me, okay? Remember the Potato? 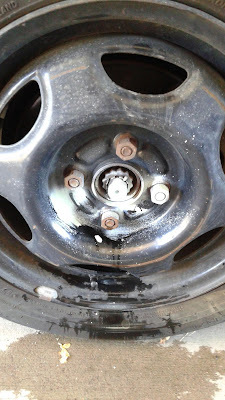 (That is what Jeffrey always affectionately called his car) Well, we found some spray paint and, um..."
Jeffrey and I heard those words and rushed outside to assess the damage. A beautiful blue randomly painted all over his car. Thank heavens it wasn't his new car! We tried to talk to the kids, but Keith kept running and hiding, Faye continued climbing all over his car, and Beth was just being her adorable cute self. We still have no idea what they were thinking. 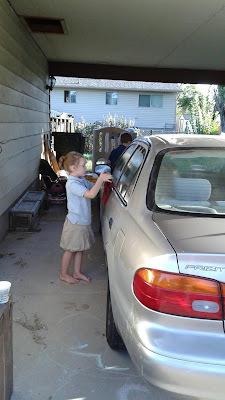 Happily, we discovered that warm water and dish soap can take freshly sprayed (and dried) paint off a car. Thank heavens! 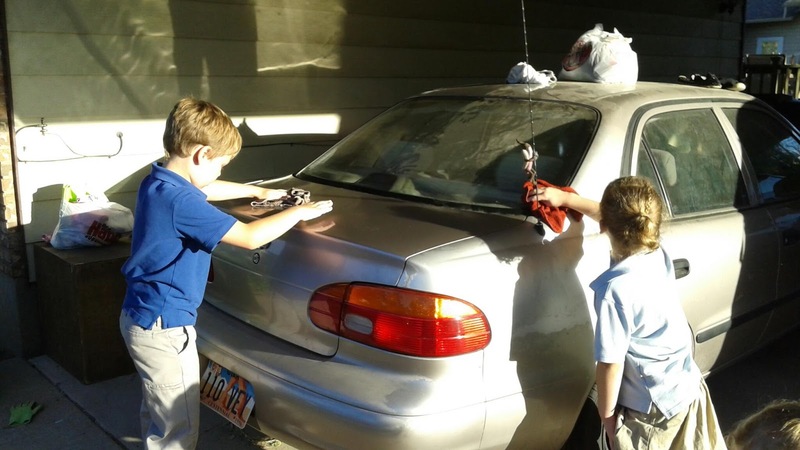 The children were given rags and the water, and proceeded to wash not only the paint off the car, but all the accumulated dirt, and anything else they could reach. His car got a much needed wash.
And then we had a much minified version of our annual October 1st party. Gorgeous monster doughnuts from Krispy Kreme, and we watched some old Mickey Mouse Halloween cartoons before the kids went to bed. It was a long shot from our traditional celebrations, but at least we were able to have one despite my migraine and crazy amounts of morning sickness. Aww! Not an angel, but I feel like a celebrity making an appearance on your blog! And you are more than welcome for the help! Just glad I'm here!